What is Chen Buying? What is Chen Selling? – This is a stock newsletter published and distributed by Lin Asset Management LLC. Chen Lin was a Chinese doctoral candidate in aeronautical engineering at Princeton, but Chen found his investment strategies were so profitable that he put his Ph.D. on the back burner. Chen has continued to turn out exceptional profits using both a value-orientated approach as well as technical analysis for market timing. Chen's track record is phenomenal! 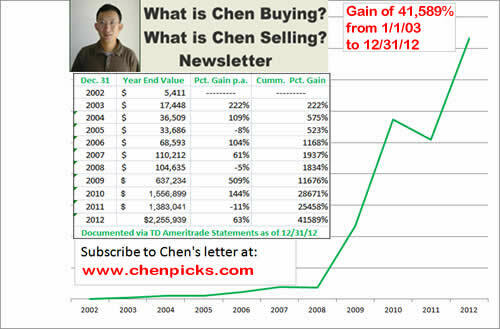 In one account we tracked, he was able to grow $5,411 starting in 2002 into $2,255,939 as of December 31, 2012.